Rare. Neurocutaneous syndrome. Sporadic. Caused by somatic mutations (mosaic) of the HRAS gene (11p15.5), the KRAS gene (12p12.1) or the NRAS gene (1p13.2). 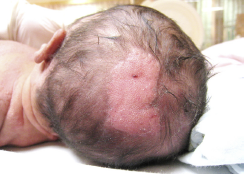 A sebaceous nevus is present in 1 to 3 infants on 1000: it is estimated that about 10 % of them develop extra-cutaneous signs. Perioperative management of infants with the linear naevus sebaceous syndrome of Jadassohn: a report of two cases. Schimmelpenning-Feuerstein-Mims, syndrome (nevus sebaceous syndrome). Wang S-M, Hsieh Y-J, Chang K-M, Tsai H-L, Chen C-P.
Schimmelpenning syndrome: a case report and literature review. Pediatrics & Neonatology 2014; 55: 487-90. Bahloul E, Abid I, Masmoudi A, Makni S, Kamoun F, Boudawara T, Triki C, Turki H.
Le syndrome de Schimmelpenning-Feuerstein-Mims : à propos d’un cas. Arch Pédiatr 2015 ; 22 :1157-62.